This is one CX race I was super upset to miss, but knew better with a nagging knee injury, and the expected conditions of MUD BOG. There’s a reason Enumclaw is nicknamed, the “claw” too. Cause it grabs at you, robbing speed, and sometimes throwing you down into the mud. 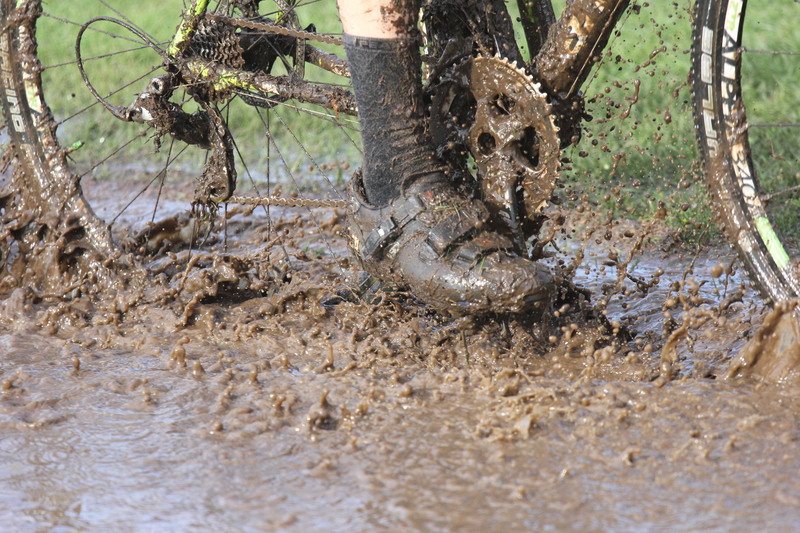 The ENTIRE course was a slick, deep, muddy mess. ‘Tractor Pull’ conditions, 400 watts @ 4 mph. Any firm green grass that could be found was a blessing. I spent the entire hour searching for firm ground. Another small Single Speed A field. This time my start was not so good, last place chasing the group through the first lap. Then, as everybody settled in, I started pulling them back one by one. Midway through the race in 3rd place and the leaders still in sight I clipped a chain link fence and hit the deck hard. I took inventory to make sure all limbs were still pointing in the right direction, climbed back on continued my search for firm ground. Finished the race on the lead lap (thanks Russell Stevenson) and held onto my 3rd place for the day and series lead. Well raced! I was icing my knee, while Brazel was searching for firm ground. The course was a two mile flat loop that I heard felt completely uphill with a 50+ft run up. Speeds ranged from 3 to 6.5 mph and in the elites, 10-min laps. Epic as the claw always is. See the rest of the photos Peter shared on G+ and Flickr.